In 1793, George Macartney headed the first British diplomatic mission to China – The Macartney Embassy. This mission was established to set ports of trade between China and Britain and establish permanent relations between the two world powers. Unfortunately, the Chinese Emperor Qianlong did not see the need for trade with Britain. Details of the mission and voyage were published by Aeneas Anderson who reported on major details of the mission. This work, entitled ‘A Narrative of the British Embassy to China’ was a highly desirable work throughout Britain in the late 18th-century. So popular in fact that abridged versions were published. One such edition was ‘An Accurate Account of Lord Macartney’s Embassy to China’ edited by Aeneas Anderson, a servant to Macartney on the mission. 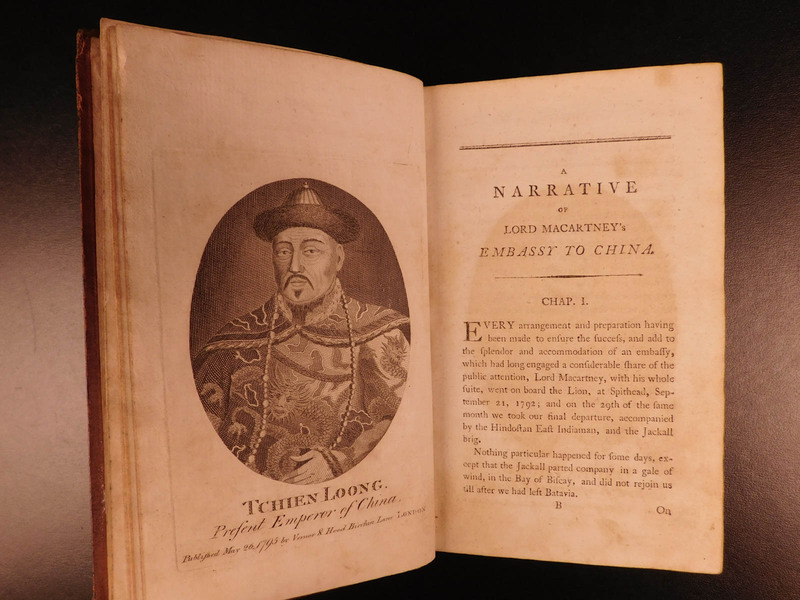 This 1797 printing of the abridged edition describes in detail aspects of Chinese culture, religion, temples, Chinese military and soldiers, reports of the Great Wall of China and elements of British trade in the 18th-century. London: Printed for Vernor and Hood, No. 31, Poultry. 1797.